Birdbaths are popular with all birds, even birds that otherwise wouldn’t visit a bird feeder, making them a great addition to your back yard. Watching a small flock of American Goldfinches lining up around the rim to drink or an American Robin taking a bath is a joyful experience. 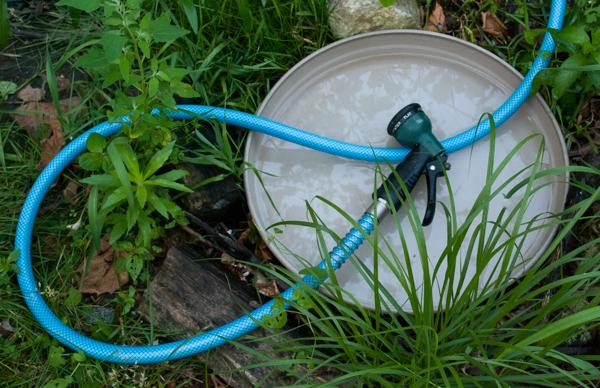 Because birdbaths are located outside, one common way to fill them is to use a garden hose. But is your hose actually providing healthy clean water for the birds? You may be surprised to find that it is not! This spring we planted some bird-friendly bushes in the yard. I found I needed a new hose to water some of the plants that were further out in the yard and, being an analytical sort at heart, I did a little online research about hoses. Beyond the perpetual debate over whether this hose or that hose is truly non-kinking, I researched different types of hoses, how they are made and the pros and cons of various types. In the process, one type of hose caught my eye, a drinking water hose. In my research, I learned that the typical garden hose leaches toxic chemicals and lead into the water that runs through it, especially when left out in the hot sun. (Check out this interesting article on “Hazardous Chemicals Found in Garden Hoses.”) This is why, when you purchase a typical garden hose, you’ll see a tag on it somewhere warning you that it should not be used to drink from or to provide water to pets. Oh wow! It had been a very long time since I’d purchased a garden hose, so I hadn’t considered this at all when filling my birdbaths. 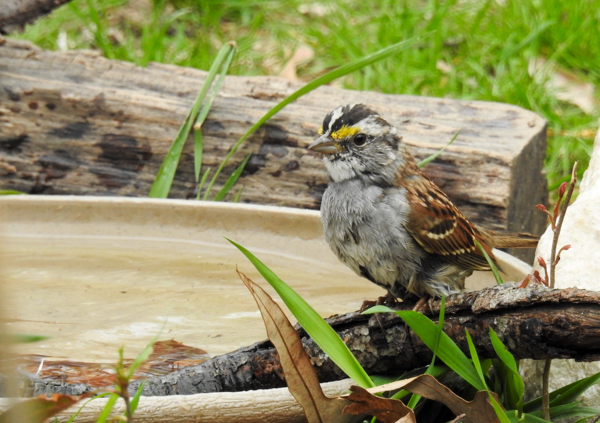 If hose water isn’t good for people and pets, my guess is that it isn’t great for our feathered yard visitors either. Supposedly this water is okay to use for things like watering the lawn or a newly installed tree or bush, but if you have a home garden, do you really want to water your herbs and vegetables with lead and chemical tainted water? And providing the birds with a chemical and water cocktail? Yuck! When I made the connection that this hose water was probably not something the birds should be drinking, I temporarily went back to my winter time practice of filling the birdbaths using a large pitcher filled from the kitchen sink’s faucet. Then I set out to purchase a drinking water hose. I’ve been using this hose to water my herb and vegetable garden and to fill my birdbaths for the past month. It does appear to be a good quality hose and I’ve had no problem with it. So far, it hasn’t kinked either. I feel better knowing that the water I’m providing for visiting birds is now cleaner and free of these chemicals and lead. Wow! Great learning post here! Thanks so much! I like the homemade birdbath you have pictured. I have to look on your blog here to see if you listed the materials to make this birdbath 🙂 I love your blog & learn so much with each posting you provide, thanks again.